Well, we've finally had our first snowfall up here in the Skatch. The middle of November, that's really odd - it seems that we usually have snow sometime in October. This year, Chewie is sooo all about the snow. We got out the winter jackets and toques (that's what we Canucks call a wool hat... start spreading it around) and mittens and B-rad, Chewie and i had a bit of a play in the backyard while Artoo was napping. Faster, Daddy, Faster...NO!! TOO FAST!!! On 11/11/'11 at 11:11am i took part in a world wide Zentangling event - as CZTs from around the globe got together to tangle at 11:11 in their respective timezones. This was my tile. 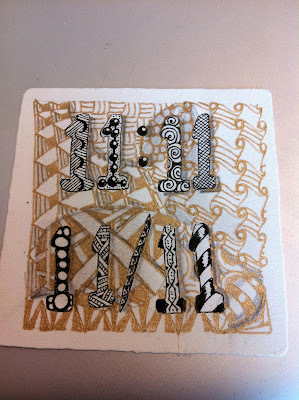 I used a gold Sakura Gelly roll pen because 11/11/11,11:11 only happens once in a lifetime, and it was pretty magical. as the week wound down, i found myself really super tired and feeling kinda 'off'. i'm hoping against all hope that i'm not getting sick... luckily, for me - and for you - this week is a guest post! The lovely and talented Sue Clark, CZT is sitting in for me this week with her excellent challenge. 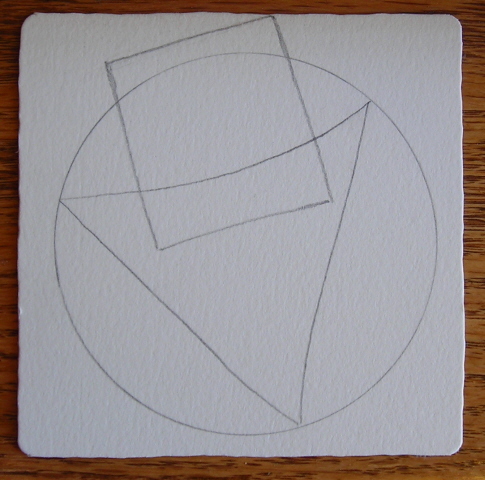 Three basic shapes (circle, square, and triangle) when combined can be used to create a string. Just like the infinite possibilities of putting tangle patterns together, using these 3 shapes together and altering their size and placement on the tile would create infinite possibilities for a string idea. I also thought it would be fun to also 'tri' all new tangles (ones you have never tried before). I have attached my before and after tiles and the names of the new tangles I tried are: Zuan Shi, Sanibelle, Gloven, Amaze, Krli-Q's, Rosé. Sue's bio: I am married and have two daughters. I have had a love of drawing and many other arts & crafts over the years while working and raising my two daughters. I retired from a 36 year career with the federal government and before I knew it I was off to New England in Oct 2010 to become a CZT. I was the first CZT to teach in the state of Colorado. 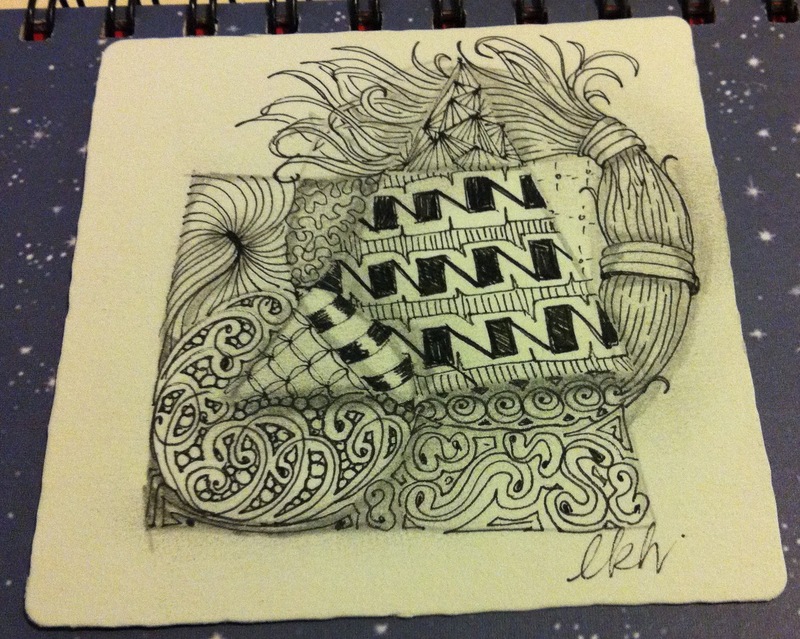 I teach in the Loveland/Fort Collins area and love sharing Zentangle with others. I have experienced so many new things this past year (becoming a CZT, starting a small self employment business, teaching classes, starting a blog, sharing art work on Flickr, etc.) and have met so many wonderful, talented, and supportive people in person and online. We never know where life will take us....and I am sure enjoying the ride! This week's challenge is to create a tile or ZIA using the basic shapes Circle, Triangle, and Square TOGETHER as your string. For extra imaginary bonus points, use tangles you've never used before! i can't wait to see where you take it! I managed to try my hand at this, and i'm not too wild about the way my tile turned out - but it's a challenge to post, even if it's not your best work... so there it is. Oof da, this one was a challenge. I love your tile Laura....it is gorgeous! I cannot post again with my Google account. It tells me to sign out and sign in again in another account. I can post on the blog, however. The one under the slideshow that doesn't show up. It takes it there. Oh well. This will work. I'm Mel. I'm not anonymous. vicmelhorse. This was a very hard tangle for me. If I wasn't doing the tangles, it was because they were either too hard for me or I didn't like them. When I went back through the books to find some new ones, I was correct. I hadn't done them because they were flowery or hard to do. So I tried them. I need to continue to "challenge" myself more often. This was a great idea Sue. Thanks so much. And thank you too Laura!! vicmelhorse I was number two this week. I finally finished my tangle, took me all day thanks to small interuptions! There are three shapes in my tangle pattern, there is a triangle in the middle of the circle but I fail at shading. AT least I learned something! Thanks it was super fun! I actually tried some different tangles. This was fun, Thank You! Thank you for pushing us to try out new tangles. Had fun!! And Laura I hope you will feel better soon. Thanks Sue! A fun challenge. It was great to use new tangles. Thanks for using one of mine. :) I love both Sue's and Laura's tiles. Inspirational as always. Thanks for another great challenge! I can't believe I missed tangling at 11:11 on 11/11/11.... Love the tile you did! Artoo looks so fabulously healthy and the best skin, must be all the good vegies!! This challenge made me busy-dizzy. So much fun to use tangles that are new. I tend to get comfy with the ones I like, and often need a kick to 'tri' the new ones. Thanks, Sue and Laura! Laura, always love to hear about your family. Thanks for sharing. Fantastic challenge! I love working with basic shapes! Sue, this is a terrific idea! Loved using the three simple shapes to make a string. I think I'll add this to a weekend workshop I'm planning for the spring. Thanks! Great Challenge! I especially liked the idea of using patterns I had not used before! That caused me to dig around and find some new ones..I need to do more of that...to make me expand my creativity! It took a while to get going her but when I finally settled on how I wanted to place my shapes, this was fun. I love the idea of encouraging us to use only patterns that are new to us. It was my first tangle in a while and I enjoyed it. Made mine with Micron 005, so very thin. Coloured it with colourpencil. Thanks again for a wonderful challenge! 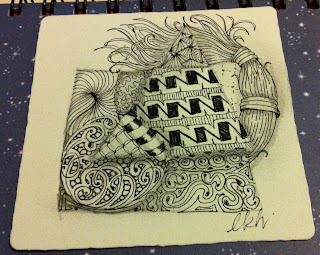 It was a good opportunity to work on a few of the newer to me Zentangle tangle patterns..
Fun challenge. I like trying to incorporate the "new" tangles. This was an interesting challenge the string parameters were challenging but stretching is always tough in the beginning. I liked trying the new tangles on my second version (once I reread the directions!). You are amazing Laura, so much on your plate but you still give to us, enriching our lives. Many thanks. I always like to "tri" new tangles. It was the string part that challenged me the most this time. Thanks Laura, as always. Love your "premature baby" post. So amazing, huh? And thanks to Sue Clark for the great challenge theme. Today I'm sliding in at #45. I so love the challenges. They stretch my imagination and my skills as well. The experts give me ideas and standards to aim at. Its such a boost to have something engaging to work with each week. Also I have so loved passing on the tangles to my students. Some have really taken to the patterns and incorporated them into their artworks. This too is very rewarding. Hopefully I've timed it right...I'm #45 today. Laura, hope you feel better soon. Nice to see Sue as guest and it is good challenge and it got me bit longer to do it and enter. Look forward to next challenge. Have nice weekend everyone! Laura I owe you special thanks. 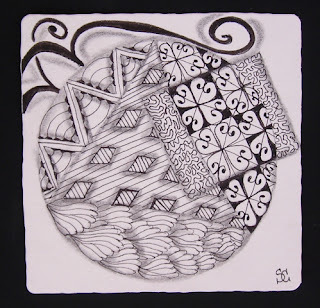 My Blog Xplore & Xpress is one year old and I have recieved tremendous encouragement from the zentangle community through your weekly challenges. Thank you zentangler friends for cheering me in the last lap of my one year blogging race. I am at #34... and winning Laura's prize will be the icing on my blog's birthday cake! I am opening my account by posting my response to the challenge 48, independently! Hope to receive encouragement. I could perhaps be in the minority group of 'male zentanglers'. Would love to have more male anglers! I am at #49. Do visit. Extremely sorry for the typographical horror (error) I made in my comment. Please read 'tanglers' in place of 'angler in the penulttimate line. I'm finally back in the swing of getting a challenge done and posting it by Saturday! Yea! I enjoyed the challenge, as always. Have a blessed weekend. Thanks so much for allowing me to host the challenge this week, Laura. Lots of fun! Your tile is beautiful! I loved seeing Artoo in the laundry basket. It brought back memories of my kids in the laundry basket or the toy box-LOL. What a fun challenge!! This one took me a while to do -- I found myself exploring different blogs looking for new patterns. There is so much talent out there! Tangling you way at #58. Interesting challenge, thanks. Happy Bremie back to you. I thought this would be hard to do, but once I got into it, it was really fun. All the tangles are new to me, so these challenges are fantastic for me to push myself to practice more!